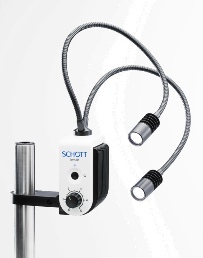 The new Schott EasyLED light source has a smart design and allows the user to upgrade their stereomicroscope illumination without buying a new ‘scope. 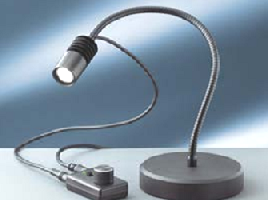 It can be mounted to any microscope stand or used as a stand-alone illumination device. Brightness is equivalent to a 100W halogen cold light source. operation via integrated “jog dial” wheel. • Continuous dimming from 0 to 100%. • Wide input range power supply (100 - 240 V). • World wide plug (clip system).